NASA chief Charles Bolden talks with other mission managers in Firing Room Four of the Launch Control Center as they monitor the countdown of the launch of the space shuttle Endeavour and the start of the STS-130 mission at NASA Kennedy Space Center in Cape Canaveral, Fla. on Monday Feb. 8, 2010. 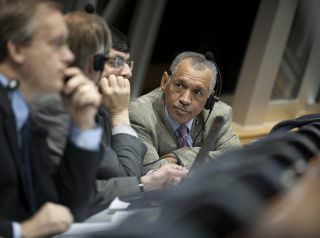 NASA chief Charles Bolden unveiled new work orders for spacecenters across the country Thursday to pull them in line with the new spaceplan envisioned by President Barack Obama, and assured that new jobs will comefrom the transition. ?A very serious and real concern is the jobs, but this iswhat we call progress,? Bolden told reporters in a teleconference. ?We?reexpanding the number of programs that we have so that we can try to put peopleto work who are interested in being a part of thespace program.? NASA?s new space plan, unveiled in February as part ofPresident Obama?s 2011 budget proposal, calls for the cancellation of theagency?s Constellation program in charge of building new rockets and spaceshipsto replace the aging space shuttle fleet. NASA plans just fourmore shuttle missions ? one of which is under way now ? before the fleet isretired in the fall. Instead of building its own new spacecraft, NASA plans tosupport the development of commercial spacecraft to transport astronauts and cargoto the International Space Station, which got a life extension through at least2020 (five more years than planned) under the new plan. No specific destination for U.S.human spaceflight, or a timetable for how one could be achieved, has beenrevealed by NASA or the Obama administration, which has led to widespreadcriticism from lawmakers and the public. But by reorganizing all 10 of NASA?s field centers acrossthe country, the space agency will be better equipped to meet the president?sspace ?vision? and will create additional jobs with the new programs to offsetat least some of the thousands expected to be lost as the shuttle fleet retiresand Constellation is cancelled, Bolden said. ?The thing that makes it different from any other vision isthe fact that it?s funded,? Bolden said. In his budget proposal, President Obama proposed a moderateincrease for NASA overall, but set aside $6 billion over five years to spur thecommercial spacecraft industry. The plan calls for a renewed push intofundamental technology development and science research. NASA officials hope that by ceding astronaut launch servicesto the commercial spaceflight industry it will be more free to pursue moreambitious missions to explore the moon, Mars, asteroids and stable points inspace called Lagrange points ? ideal locations for fuel depots or giantspace telescopes. Congress still has yet to approve the president?s proposedspace plan. President Obama is expected to visit NASA?s Kennedy SpaceCenter in Florida on April 15 to go into more detail on his space plan. ?There are many great opportunities here for NASA and forthe nation, and I think there are many proud moments ahead of us,? Bolden said. The new assignments include, for example, orders for NASA?sKennedy Space Center in Florida ? historic home of the space shuttles ? tooversee the agency?s commercial crew-carrying spacecraft program. The spaceportwould also get a $2.3 billion makeover over the next six years to turn it intoa 21st century launch complex. The Johnson Space Center in Houston ? home of America?sastronaut corps ? will oversee the agency?s commercial cargo program toresupply the space station. The center will also lead NASA?s flagship technologyprogram to develop fundamental new technologies, such as inflatable habitationmodules and in-orbit spacecraft refueling, needed for ambitious trips to themoon or Mars. The new space center assignments also follow on the heels ofNASA?smajor overhaul of its center-driven system instituted by Bolden earlierthis year. In that reorganization, Bolden ordered the heads of all 10of the agency?s regional field centers, as well as its four headquarters-basedmission directorate chiefs to report directly to his Administrator office,rather than the office of Associate Administrator Chris Scolese, NASA?sthird-top official. The centers and directorates had been reporting to Scoleseunder a structure put in place by NASA?s former chief Michael Griffin.? Meanwhile, NASA?s space shuttle Discovery is docked at theInternational Space Station to deliver more than 8 tons of supplies, scienceequipment and spare parts. The 13 astronauts aboard the linked shuttle andstation are preparing for a Friday spacewalk, the first of three plannedspacewalks for their mission. Discoverylaunched into space on Monday and is flying a 13-day mission to stock thespace station with vital supplies and spare parts.